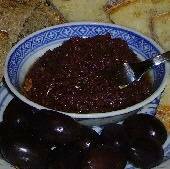 shared this simple recipe with me, explaining that it was the workers’ lunch during the summer threshing period as well as during the fig harvest. The tremendous amount of garlic—3 whole heads or more— acted as a replacement for more expensive cheese, which was reserved for the family to eat, not for its hired, usually migrant, help. Another version was sometimes made with the local cured pork. In an effort to replicate the fresh homemade pasta described, I have simply called for fresh fettuccine or egg noodles. As for the garlic, don’t be daunted by the amount. Boiling garlic is to the Greeks what roasting it is to the Italians—a way to mitigate the sharpness of the stinking rose and bring out its inherent sweetness. 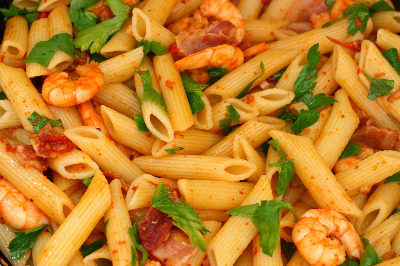 Bring enough salted water to cover the pasta by about 1 inch to a boil. Add the pounded garlic and pasta and boil all together until the pasta is cooked as desired (traditional Greek cooks like it soft, not al dente). Remove with a slotted spoon, making sure some of the liquid and all of the garlic end up in the serving bowl. 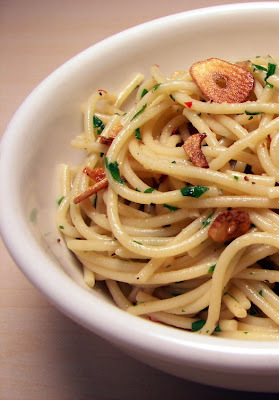 Toss the pasta with the olive oil and serve.